Christmas in July Sale Event on Etsy & Amazon! Dear friends, I am back to working on my Russian bead painting. Here is the latest progress – I have finished beading a large tree. The tree was created by first sewing together a felt foundation with several holes in it. I used a combination of bead embroidery and freeform peyote stitch to create a leafy texture which can be seen through when you move them around. Below is a sneak peak of what it might look like in the finished piece. This portion of the beadwork (tree + cathedral) measures approx. 12″x 15″. If you would like to see more photos of the progress of this piece, please visit this Facebook photo album. Dear friends, a new bead- embroidered pet portrait is now available for sale on Etsy – a pink Pomeranian! Or perhaps it looks like an American Eskimo dog to you? A customer suggested this color to me awhile back and I liked the idea because I’m sure there is someone out there who has dyed their Pomeranian’s hair pink.. Whether you like that idea or not, I think it looks great in beads! I used tiny Japanese glass seed beads and layered beaded fringe to create this dog’s texture. I like it so much that I have added this color option for anyone who would like a pink Pomeranian pin pendant or earrings! It would definitely be a conversation piece! Please check my Etsy and Amazon shops for more details. Thanks for looking! Dear friends, I would like to share with you the progress of my latest custom order. 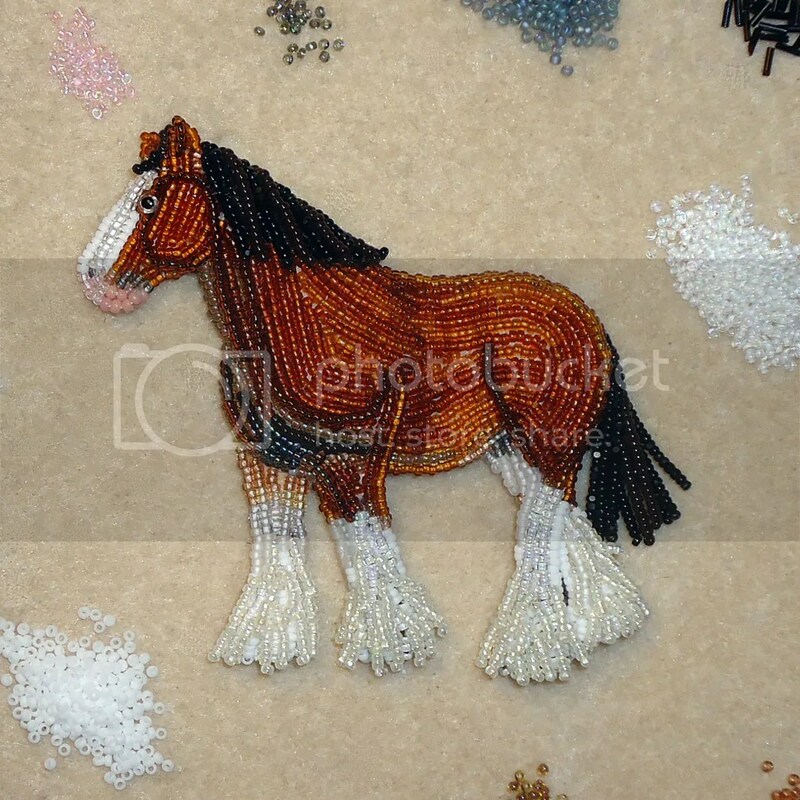 This is a new animal pin for me, one of which has been on my list for awhile now.. A beaded horse – in this case a majestic Anheuser-Busch bred Clydesdale horse:) This animal is much larger than the usual dogs & cats that I create, so the size of the pin must be larger as well, otherwise the details will be lost. So, I worked on a drawing based on the photo below and resized it to about 3″ x 3″.. This is usually a good size for a large brooch. Next, I created a paper template which I used to cut out several layers of felt. The first layer is a stiff beading foundation, and the top layers or shapes were cut from felt. I can use any felt that I have on hand, either acrylic or wool. I stitched the layers of felt to the stiff stuff to create my overall foundation. 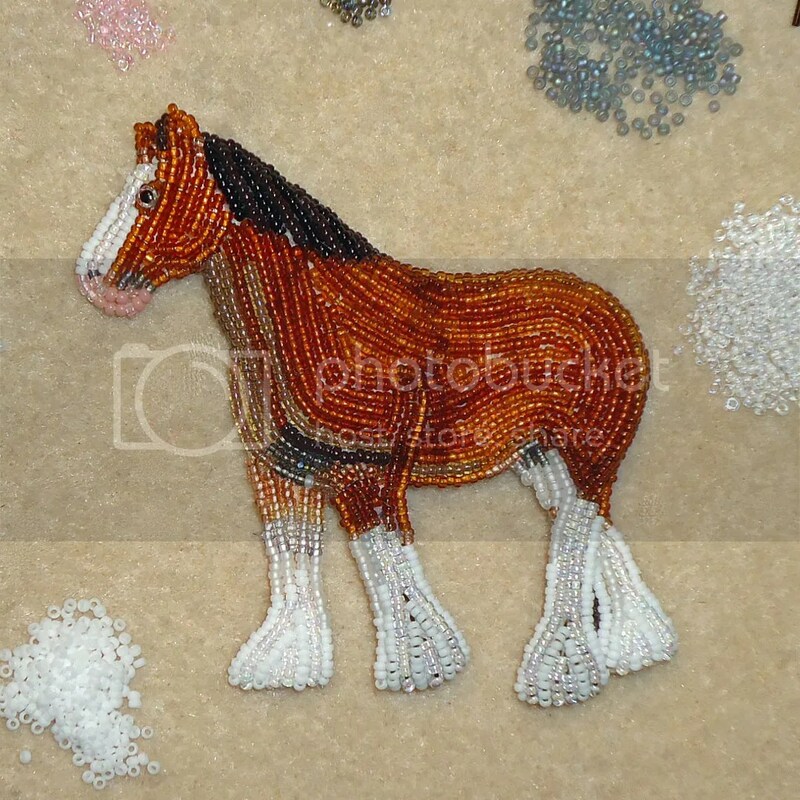 Next, I began by stitching a special 2mm glass eye onto the horse’s face, then I began beading. I always start with the animal’s face and work from there. 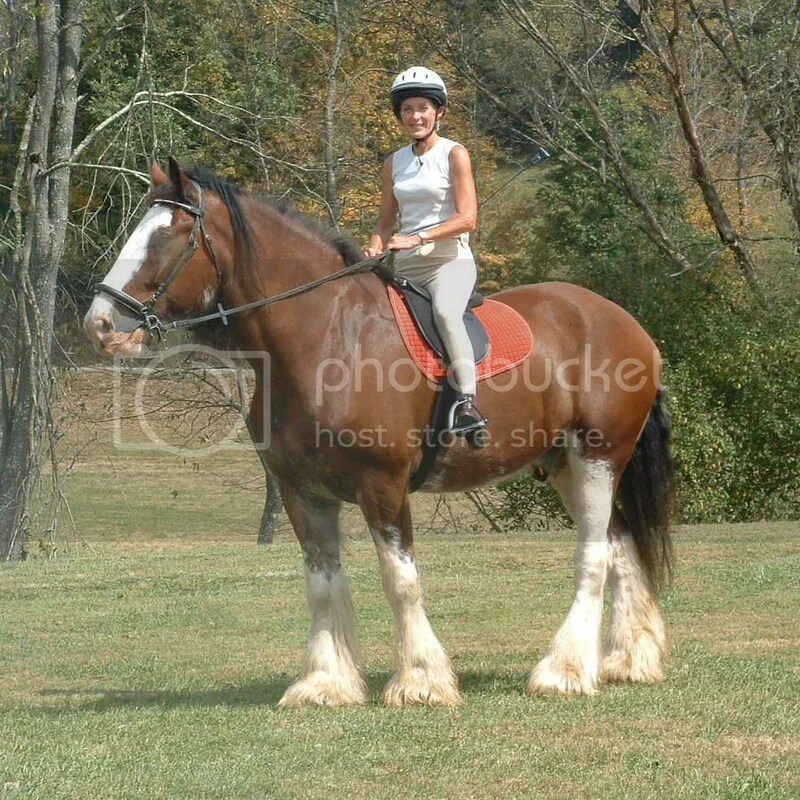 In this case, I worked on the face, then legs as I outlined the horse’s body with Japanese size 15 seed beads. Following those lines, I continued doing bead embroidery by simply filling in the rest of the legs and body. I used several different colors of seed beads to achieve the shading I wanted. Once the first layer of beadwork was complete, I began the second layer. 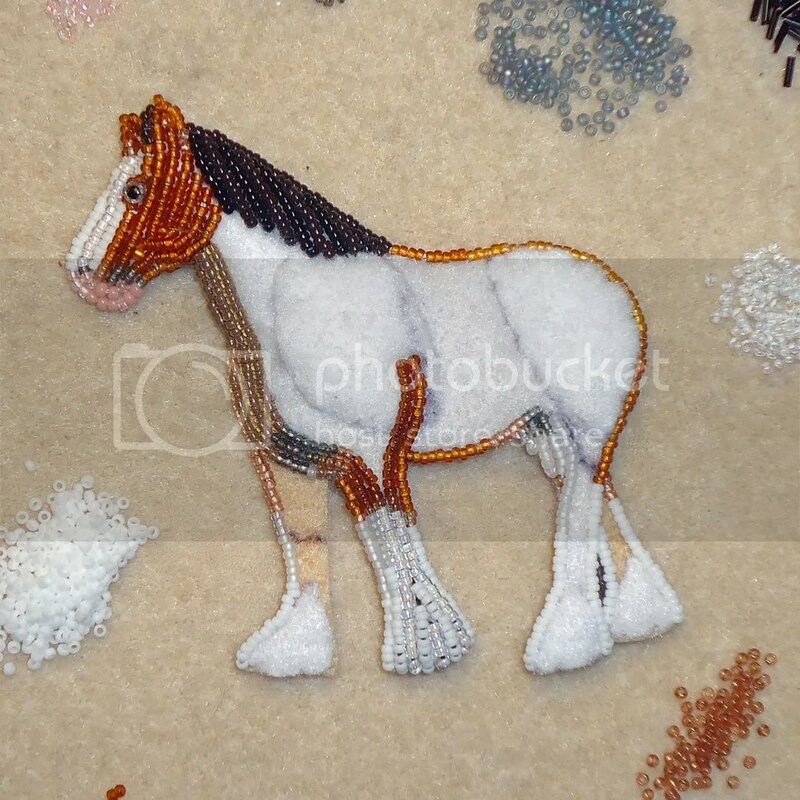 I added tiny beaded fringe on the horse’s mane and legs. I also added some more lines to accentuate the animal’s features. Lastly, I stitched many long beaded fringes for the tail. I sort of stitched these together at the top so they sit right, but that was easier said than done.